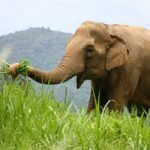 Visit this elephant sanctuary in Chiang Mai as part of a small group for a meaningful encounter with a herd of elephants in a beautiful natural setting. 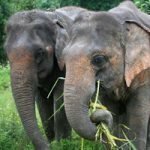 The project is run by a Thai Lanna family near Chiang Mai with 20 years experience in elephant tourism – now embracing the opportunity to end elephant riding and adopt our ‘Saddle Off!’ model offering only elephant-friendly activities. 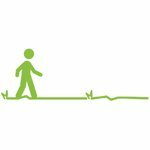 The trails run through picturesque surroundings and are undemanding, making them suitable for all ages and levels of fitness – ideal for families. Dress in traditional Lanna clothing and learn about the elephants while feeding them tamarind-rice balls. 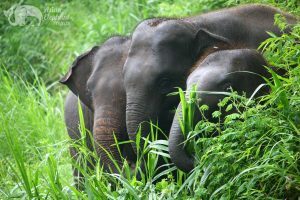 Afterwards, take a relaxed stroll with the elephants through the grassy hills and stream, stopping to feed them along the way, watch them forage, and take photos. The elephants in this herd include highly spirited young elephants as well as a kind older female elephant who watches over them. 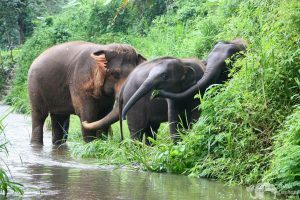 After a delicious vegetarian buffet lunch, including fresh produce from the family’s garden, bathe the elephants in a nearby stream, and watch them play in the mud if the mood takes them. 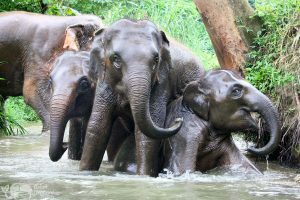 Join this popular tour for a memorable day full of insights into the lives of these extraordinary animals in an environment where they can relax and just be elephants. 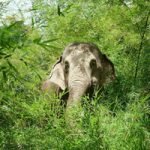 The family reports that the elephants are much happier in their newfound freedom, with a significant improvement in their health. The elephants at the project have developed close relationships thanks to being able to interact freely as a herd. Topography: Valley, grassland, hills, stream & pond. Nearest Airport: Chiang Mai (CNX) – we recommend you stay in Chiang Mai city the night before your visit. Please note that we cannot collect you from Chiang Mai Airport – only from your Chiang Mai city hotel. Booking Details: Bookings close at 5pm (GMT+7) on the day before the date of your tour if made in person at our office or 24 hours in advance if booking online. A 30% non-refundable deposit is required to secure your booking. 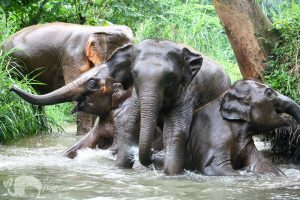 The balance should be paid at our Chiang Mai office by 8pm on the day before your visit to Elephant Trails. 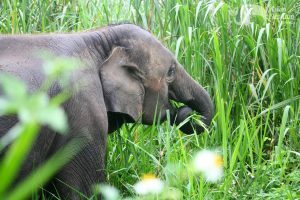 The owner of this project, Ya, and her family have been involved with elephants for over 20 years. 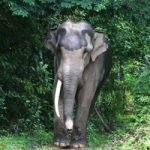 They ran a traditional elephant trekking camp for close to a decade and witnessed the toll that elephant riding took on the elephants over time. 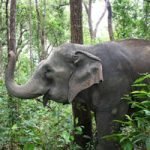 In recent years, they noticed the tide turning away from this form of elephant tourism as more and more people want to see elephants living happily in nature. This was a change that the family was keen to embrace and in early 2017, they dropped elephant riding and adopted our ‘Saddle Off’ model. The family reports that the elephants are in better health and are enjoying their freedom with the chance to roam and socialize as a herd. They have formed strong bonds since being able to interact and relate to each other as members of the herd. Thank you so much for an amazing experience. It was incredible to be so close to elephants. Thank you also for the great food. Thank you so much to the team for an amazing day! We had so much fun and it was wonderful to get so close to such happy and beautiful elephants! Absolutely the best thing we’ve done in Thailand. Such an amazing experience from start to finish. The best time I’ve had yet. Thank you for opening your home to us! We had such a wonderful day with the elephants! Thank you for protecting these beautiful animals. We hope to come back some day! What a brilliant day! Wonderful to see the elephants so relaxed. Thank you for the experience. Thank you so much for an amazing experience! It is something I will never forget! Absolutely incredible. I will be back some day! Being with elephants was my dream since I was a little girl. Today that dream became real because of you! It was an amazing experience, thank you for everything. I will never forget this. Thanks for such a wonderful experience! We could not have asked for a better time with the elephants and everyone at the project. This was a more incredible experience than I could ever have imagined Thank you for the memories and all the wonderful pictures. Thank you so much for a fantastic day with the elephants. I had a lot of fun and everyone was so gentle with the elephants. Such a magical and once in a lifetime experience. Hope to come back again very soon! Thanks for an amazing time! Thank you for the super fun and amazing day! Also, thank you for what you do. Good luck and we will help spread the word! You guys are amazing! Thank you so much for this truly unique experience! We had an amazing time and were deeply impressed by the elephants, tour guides, and beautiful surroundings. Thank you for this amazing experience! Your love for the elephants is shown in every way that you treat them. I will definitely be back. You are all amazing! Today we had such a great time! Thank you so much! We learned so much and had so much fun feeding and bathing the elephants! We made new friends today – the elephants! The elephants were amazing and beautiful. We did not want to leave them. Thank you for teaching us so much about them. Never in our dreams did we think that we would get the chance to bathe with elephants in Chiang Mai. We will never forget those moments we had with the elephants. Thank you. Thank you so much for the unforgettable day – our last day in Chiang Mai. Every minute was pure joy. This was a dream come true and we thank you for giving the elephants a new happy life – they are so fortunate to be cared for by you. Such an amazing experience and our guide is such a sweetheart. The elephants look so happy and that’s what matters. Probably my highlight of Chiang Mai! Today was a dream come true! I loved learning about the conservation efforts for the Asian elephants. Interacting with them was indescribable! Thank you so much for running a genuinely happy and ethical rescue project. 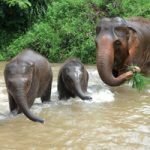 We loved this experience and the elephants! This was the best time we had in Thailand. Thank you!!! Thank you very much for this wonderful experience! It is so great to see that the elephants have a good life here. I had so much fun playing with the elephants. It’s so good to see them safe, happy, and loved. Thank you for all of the work that you do! I’m thrilled that these animals are safe in such a beautiful home! Thanks for an amazing day. We were most looking forward to this and it far exceeded our expectation! Tour guides were so nice. Awesome day. Thanks!